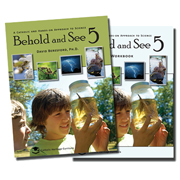 Behold and See 5 is an up-to-date, Catholic science program written by Dr. David Beresford, a college professor, working scientist, and homeschooling father. Written for Catholic homeschooling families, Behold and See 5 combines a stunning, full-color interior with hands-on experiments and engaging scientific content from a Catholic perspective. Since faith and reason are inseparable, the main goal of Behold and See 5 is to teach up-to-date scientific knowledge in the context of our Holy Faith. The text provides an in-depth, conceptual understanding of selected topics from biology, human anatomy, earth science, chemistry, and physics. It gently communicates the richness and order of God’s creation, and reflects on the proper use of scientific knowledge for the glory of God. Besides being Catholic and current, Behold and See 5 is one of the most engaging science texts you will ever use! Dr. Beresford’s enthusiasm for science can be clearly seen in the text’s conversational style, the abundance of hands-on experiments, and the eagerness with which he helps students actually “do science” for themselves. A working scientist himself, Dr. Beresford will soon have your child digging for worms, recording weather data, and organizing experiment results in graphs and tables. The accompanying Student Workbook provides kid-friendly exercises, tests, and a complete answer key to complete this full-year course. David Beresford, Ph.D. (population biology/entomology), teaches biology at a variety of levels: university courses in Introductory Biology, Statistics, Euclidean Geometry, and Mathematics at Our Lady Seat of Wisdom Academy, and Entomology and Invasive Species Biology at other institutions; high school biology at Wayside Academy, a private Catholic school, and elementary science to his own children at home. He writes articles about G. K. Chesterton for “Gilbert Magazine” and has also been published in “Catholic Insight” and other magazines. His scientific research focuses on finding ways to control the insect pests of dairy and beef cattle and studying species’ diversity in northern habitats. This work has been published in various ecology and entomology scientific journals. He lives with his wife and children on a farm in Dummer Township, Ontario, Canada, where they raise pigs, geese, and chickens.